Google has finally built its own car from scratch. And it looks like a gondola with wheels. The two-seater prototype vehicle is Google’s reimagination of what the modern automobile should look and feel like if you took the human out of the transportation equation and designed something solely to chauffeur passengers from point A to B. “The project is about changing the world for people who are not well-served by transportation today,” Google co-founder Sergey Brin said at the inaugural Code Conference in Rancho Palos Verdes, California. The car — which was conceived and designed by Google, unlike the ones it previously modified — lacks many of the trappings of a normal car, and that includes three of the most essential parts. It has no steering wheel, no accelerator pedal and no brake pedal. The company that designed the world’s simplest home page also decided to lose the mirrors, the backseat, the glove compartment and the stereo. What’s left are lots of sensors, and a transplant of the self-driving software system Google has built to use on the Toyota Priuses and Lexus SUVs it has trained to drive on highways and city streets over the past five years. Google gave Re/code an advance look and test ride ahead of its Tuesday evening unveiling by Google co-founder Sergey Brin at the inaugural Code Conference. It may seem like a silly thing to point out, but even though Google’s self-driving cars have racked up 700,000 miles of testing, they don’t actually drive independently. The company said the cars can handle most situations (well, when they are loaded with a map of the roads and it’s not snowing), but every time they are sent out on the road they are carefully monitored by two Google employees who are ready to take control at any moment. The new car has no such human safety net. It’s entirely driven by computers. To head off any concerns of malfunctioning robots hurtling you toward imminent doom, Google has made the car look cute and cuddly from the outset. Because of the compact, round frame of the prototype with built-in sensor mounts, Google says the car has virtually no blind spots. It also has newer and better sensors that give it the ability to see what’s going on up to a distance of two football fields. For example, on the most current version of the retrofitted self-driving Lexus, a mounted laser has about a 12-degree field of view that it uses to essentially zoom in on details of points of interest. On the prototype car, the lasers have full 360-degree views. “It’s going from looking just in front, like a flashlight, to a lantern all around the car,” said self-driving car project director Chris Urmson. The prototype car is clearly closer to what Google wants to see sold on the market, but Urmson insisted that Google has no plans to sell the cars itself. “We’re looking for friends and partners to make it happen,” he said. As of May 20, California requires a test driver to be in a vehicle and able to take over the controls, but Google is expecting a follow-up regulation later this year that will allow manufacturers to apply for permits to operate fully autonomous vehicles. Google wants to get these cars on the streets ASAP. The company plans to start testing them in Mountain View, Calif., later this summer, Urmson said. He hopes to build at least 100 prototypes over the next two years, and get them into the hands of volunteer drivers — or nondrivers, as it were — as soon as the system is evaluated to be safe. 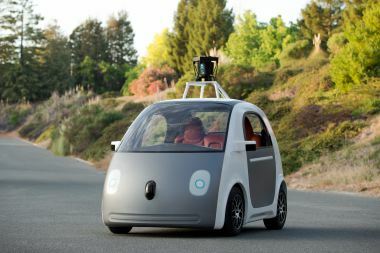 Safety is the unifying principle behind the engineering and design of Google’s car. That applies to the size, shape, materials and even the lack of horsepower. The car is limited to a maximum speed of 25 miles per hour. That speed covers most driving in most cities, Urmson said. It’s legal to drive 25 miles per hour on a street with a 35 mile per hour limit. And the slower a car is going, the less kinetic energy is involved in a crash, so there’s less potential for destruction. “We imagine at some point there will be an accident with one of these vehicles, so we’ve designed the front end to be soft,” said Ron Medford, director of safety for the project and former U.S. Department of Transportation administrator in charge of vehicle safety research and regulations. The front of the car is built with foam, and the windshield is flexible to reduce the injury the car might inflict if it collided with pedestrians, bikers or anything else, Medford said. But what if the car malfunctions? No, a steering wheel and brake are not going to magically materialize from the dashboard. Instead, there are redundant mechanical systems built in. The car has two sets of steering and braking systems, so if one fails the other can take over, Medford said. The emotional side of product development has never been Google’s strong suit. Sure, it has a colorful logo, but this is a company that groks algorithms way better than humans. But it’s hard to anticipate how people will feel about self-driving cars — both riding in them, and seeing them on the street — until they hit the road. Spoken like a robot engineer.